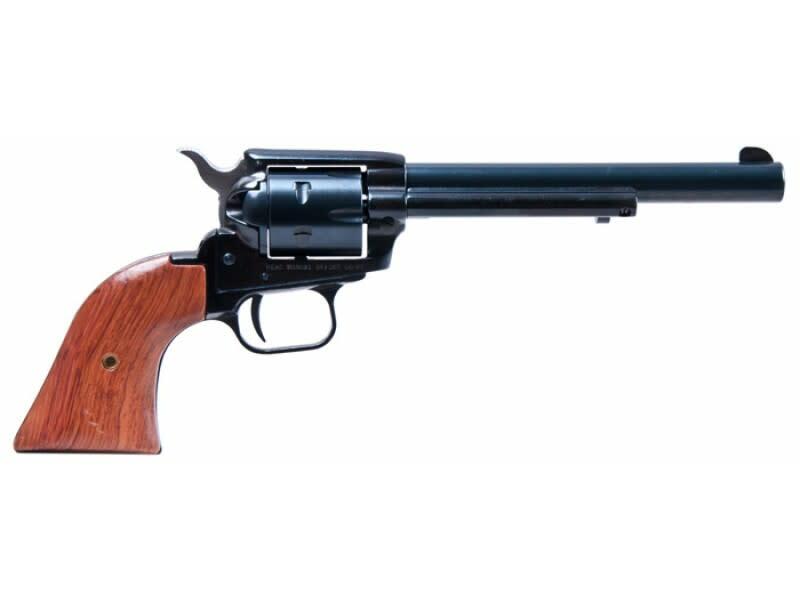 The Heritage Arms Rough Rider Revolver features a small bore and is chambered in 22LR/22MAG. 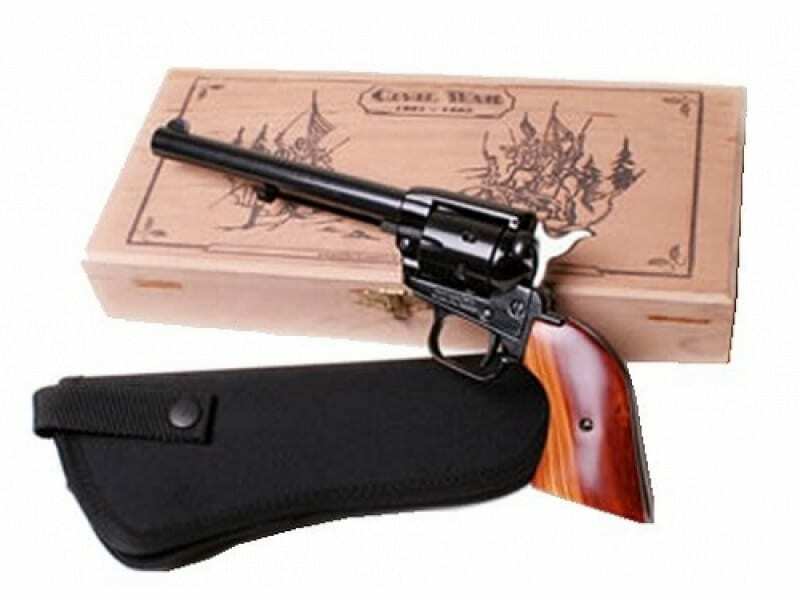 This pistol also features a 6.5" blued barrel and includes a special engraved wooden presentation box and nylon holster. Comes with both the standard .22 Long Rifle and .22 Cylinders. Born of the traditions of the Old West, the Rough Rider maintains much of the look and feel of the legendary Single Action Army revolver, only in a scaled down version. Chambered for the .22LR and .22 Magnum cartridges, the Rough Rider is manufactured using state-of-the-art-precision machinery that assures its accuracy and reliability. The cylinder lock-up is tight and the perfect timing of the action makes for a handgun that will put its shots where you want 'em. The machined barrel is micro-threaded and inserted into the frame for the optimal barrel/cylinder gap to give you maximum ammunition performance. A hammer block mounted in the recoil shield provides extra protection and has a red dot indicator that lets you know when the gun is ready for action. A new, more authentic looking flat-sided hammer paired with new exotic cocobolo grips, makes the Rough Rider both functional and handsome. When it comes to the Rough Rider there are no shortcuts taken! 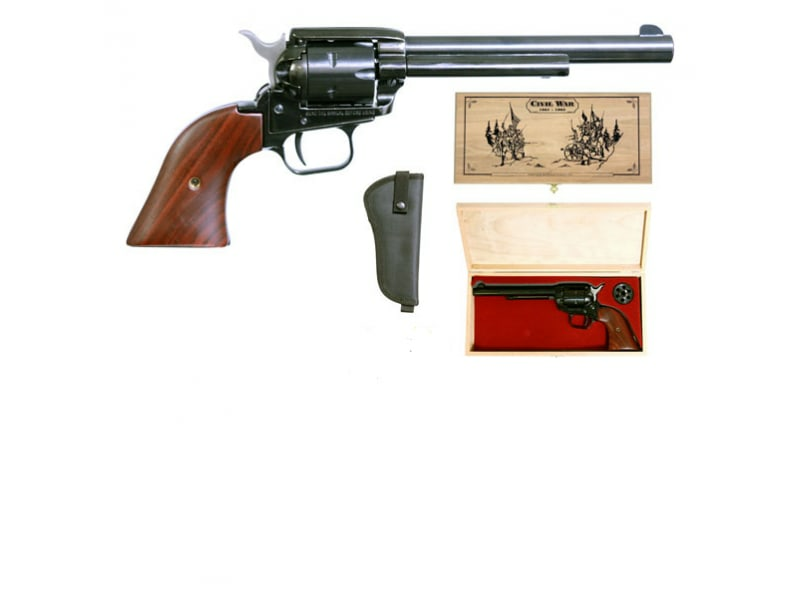 The Heritage Arms Rough Rider Revolver features a small bore and is chambered in 22LR/22MAG. This pistol also features a 6.5" blued barrel and includes a special wooden presentation box & holster. 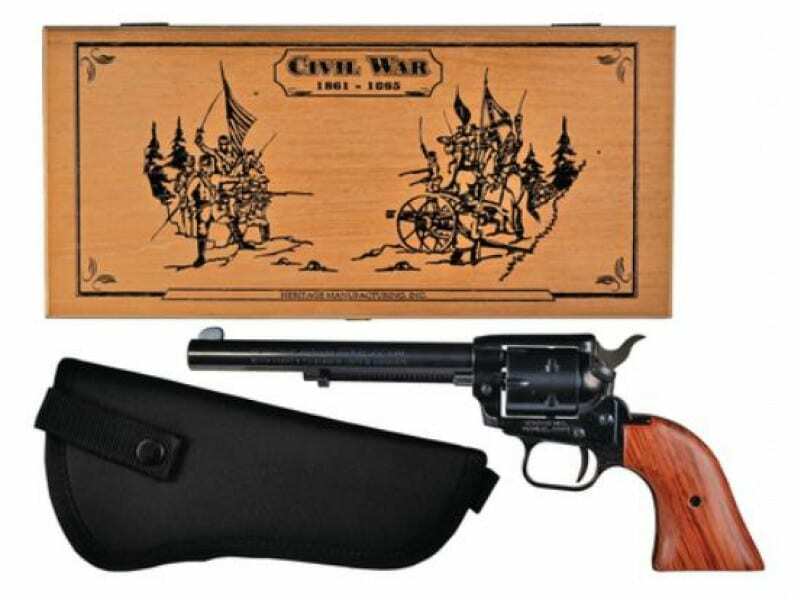 This package captures the spirit of the old west and comes with both the standard .22 Long Rifle and .22 Cylinders. Born of the traditions of the Old West, the Rough Rider maintains much of the look and feel of the legendary Single Action Army revolver, only in a scaled down version. Chambered for the .22LR and .22 Magnum cartridges, the Rough Rider is manufactured using state-of-the-art-precision machinery that assures its accuracy and reliability. The cylinder lock-up is tight and the perfect timing of the action makes for a handgun that will put its shots where you want 'em. The machined barrel is micro-threaded and inserted into the frame for the optimal barrel/cylinder gap to give you maximum ammunition performance. A hammer block mounted in the recoil shield provides extra protection and has a red dot indicator that lets you know when the gun is ready for action. A new, more authentic looking flat-sided hammer paired with new exotic cocobolo grips, makes the Rough Rider both functional and handsome. When it comes to the Rough Rider there are no shortcuts taken! 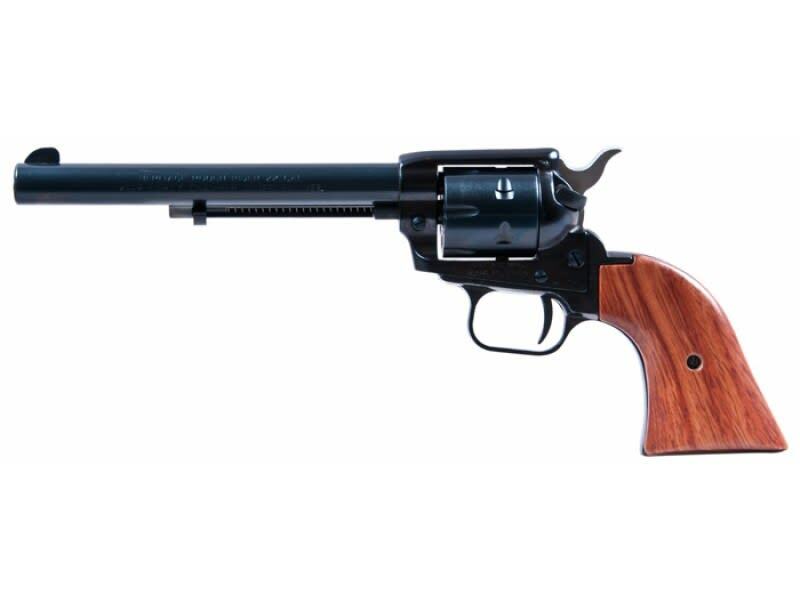 Ideal for hunting, plinking or western action shooting, let the Rough Rider be your choice in a new rimfire revolver. Born of the traditions of the Old West, the Rough Rider maintains much of the look and feel of the legendary Single Action Army revolver, only in a scaled down version. Chambered for the .22LR and .22 Magnum cartridges, the Rough Rider is manufactured using state-of-the-art-precision machinery that assures its accuracy and reliability. The cylinder lock-up is tight and the perfect timing of the action makes for a handgun that will put its shots where you want 'em. This item comes complete with dual cylinders, Special Presentation Box, and Holster.